Shear Genius specialise in Hairdressing, Floristry for Weddings, Funerals & Special Occasions and Holistic Therapies. 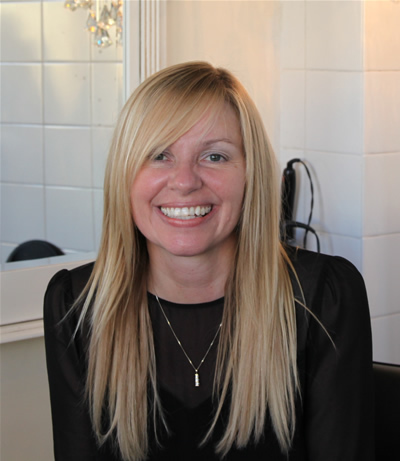 Karen Davis, the salon Director began her hairdressing career over 24 years ago. Following years in which she developed her skills in other local salons, in Switzerland and then by building up a mobile clientele, the Shear Genius Salon was established in 2003 at Walton. In 2010, the business expanded, the present salon was opened, and that business goes from strength to strength. Karen studied Racoon hair extensions in 2005 which is a fantastic way to have a full head of hair 6 months after chemotherapy treatment has ended. Please contact or visit us to find out more about our recovery programme. In addition to her hairdressing skills, Karen Davis has also studied floristry for 3 years and is a fully qualified florist. She can produce bouquets or arrangements to order for any occasion, including christenings, birthdays, weddings and funerals. Pre-ordering is essential. We have our own private wig studio and a wide selection of wigs and hair pieces, we can cut wigs to suit the clients needs.